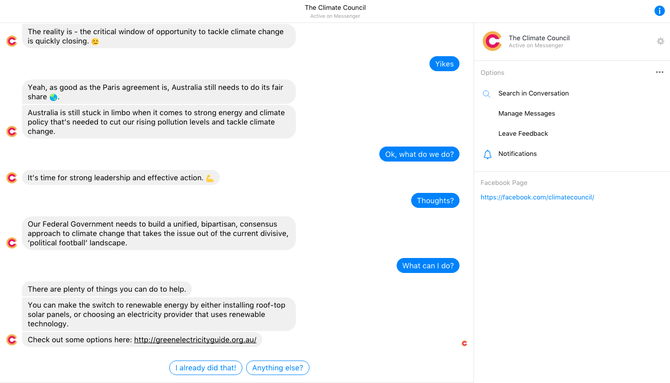 The Climate Council has become the latest brand to step into the world of chatbots, launching a new app through Facebook Messenger to better engage the millennials market. The new chatbot was developed by brand experience agency, AKQA, and is designed to assist audiences access the latest facts about climate change in a more conversational, real-time context. Housed on the Climate Council’s Facebook page, the chatbot was developed in just five days and not only publishes expert content on climate change, it can also be used to receive donations. Climate Council digital communications manager, Nelli Huie, told CMO young people in particular are saturated by content on their social media feeds. “I myself don’t ever see content from the pages or causes I really care about in my news feed,” she said. “We’ve been in this process for a while with AKQA, and when we started throwing around the idea of creating interaction through Facebook Messenger, it seemed the perfect solution. At the heart of Climate Council’s brand strategy is making climate change facts accessible and digestible in a way that motivates consumers to act on climate issues, Huie continued. The new offering taps into the insights and wealth of content already being produced by the council’s climate change specialists and presents this in a conversational format by incorporating emojis and the language of social media engagement, she said. To develop the chatbot, the council handed over the information it needed to talk to younger audiences about, and left it to AKQA to do the data integration work and turn the content into 200-character pieces suitable for a digital chat interface. The work was undertaken on a pro bono basis. Via the chatbot, users can also sign up to receive updates on new findings as they’re released every month. Huie said it’s a similar approach to how the council showcases the brand in other digital channels. The chatbot soft launched this week. Huie plans to monitor the number of people interacting and what comes through the chatbot initially, and from there, create a more formalised marketing, growth and metrics strategy for the capability. AKQ executive director, Tim Devine, said the agency’s R&D team worked closely with Climate Council to ensure its findings and research could be translated into data for the chatbot. To do this, it ran workshops to gain an understanding of the challenges the NGO faced. Initially, the lab tested IBM Watson Knowledge Studio as a way to restructure content that could train the bot to answer any question on climate change, he said. AKQA then used Google’s DialogFlow to train the bot on Tim Flannery’s book, The Weather Makes. “Neither was the right fit but the research critically informed the final product,” Devine explained. “People don’t know what questions to ask when it comes to climate change. They know topics like extreme weather, renewables, coal and so on, but not knowing the right questions to ask a bot means you only ever skim the surface.